The Walter W. Hopkinson Trophy represent the Society’s highest level of recognition for exhibitors of 20th Century material. The Trophy was established in 1953 by Mrs. Hopkinson in memory of her late husband. Walter W. Hopkinson (BIA #87) enjoyed a long and distinguished career in philatelic circles, particularly the Bureau Issues Association. Hopkinson, a member since 1928, was a plate number specialist and was most active in advancing knowledge and providing data for the benefit of the Society. 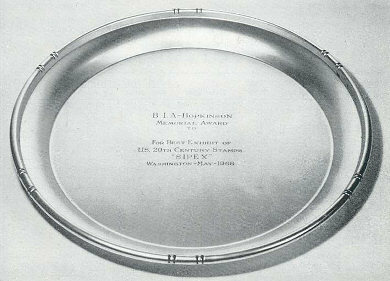 The Walter W. Hopkinson Trophy, customarily a sterling silver tray (Figure 1) was to replace the “President’s Award” begun a year earlier by then B.I.A. President Sol Glass. In 1953 President Glass created the President’s Award to recognize outstanding exhibits presented by B.I.A. members at national or regional shows like SEPAD (Philadelphia) or IFPEX (Kankakee). The President’s Award was presented at eight exhibitions in 1953. The award is presented annually at the Society’s annual meeting show for an exhibit of 20th century stamps and/or postal history, or revenue stamps or stamped paper of the United States and U.S. administered areas. The selection of the winning exhibit is made by the show jury. It is only given once a year at the annual meeting show exhibition, unless that show is an international show like World Stamp Show, NY2016. The award is for the exhibit and can be won more than once by an individual who is a USSS member. A complete list of winners of the Walter W. Hopkinson Trophy is published below.